Ferguson police attack protestors with tear gas, rubber bullets: On-site reporting. The outrageous police actions in Ferguson, Missouri. 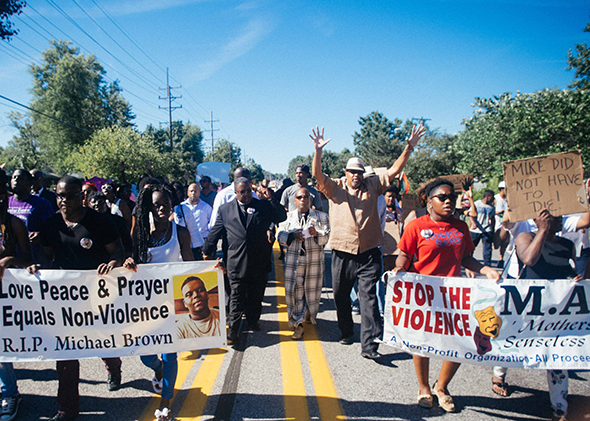 Protesters march in Ferguson, Missouri, on Aug. 13, 2014. They were energized, animated, and peaceful. They were holding signs with slogans such as “Love, Peace & Prayer Equals Non-Violence” and demanding answers from police officials, who—four days after the shooting—have yet to release the name of the officer who shot Brown, nor have they said how many times he shot the unarmed 18-year-old. Directly across from them, sitting near the intersection where rioters burned a convenience store on Sunday, were the local police, clad in riot gear and armed with batons. It was a bit much, given the modest, peaceful crowd, but it was a de-escalation from Tuesday, when SWAT teams entered the fray to disperse the demonstrators. 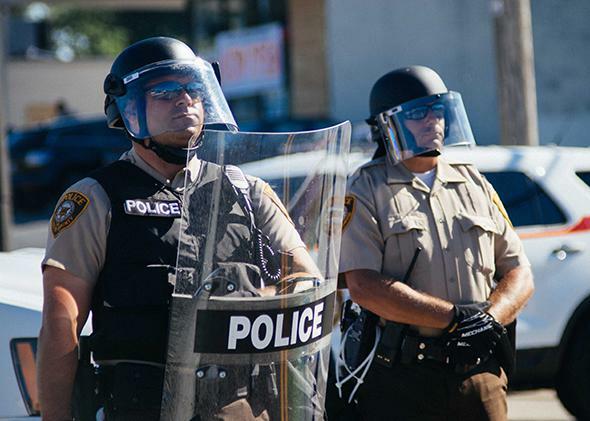 Police in riot gear stand by protests in Ferguson, Missouri, on Aug. 13, 2014. After an hour of marching, speeches, and calls for justice, most of the group moved to a nearby parking lot, where they continued to talk and demonstrate. A small number, however (including a state senator), wouldn’t budge, even after clergy asked them to move. They weren’t disruptive—they were sitting down, hands up—but they were blocking the road. Still, the situation was calm. It wouldn’t have been easy, but police could have worked with the leaders of the demonstration to move people to the sidewalks and the parking lots. 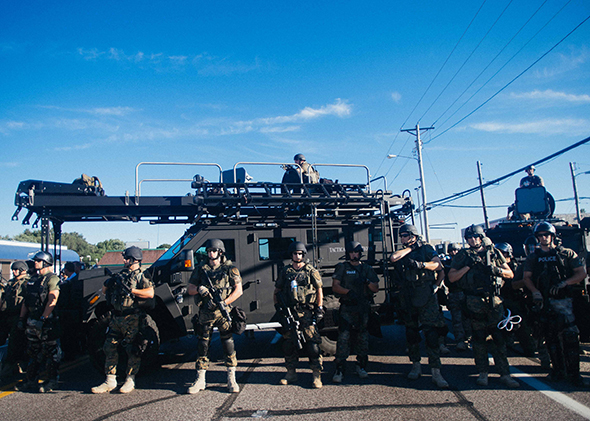 SWAT teams in Ferguson, Missouri, on Aug. 13, 2014. Instead, they brought reinforcements. Police officers were replaced with camouflaged SWAT teams—clad in helmets and body armor—and batons were replaced with shotguns, high-powered rifles, and dogs. They didn’t identify themselves, and it wasn’t clear to the crowd where they were from. But St. Louis County has been in command of officers on the street since Sunday, and one of the armored vehicles was labeled “St. Charles County SWAT.” In any case, they weren’t interested in actual crowd control. On at least two occasions, they refused to let uninvolved bystanders go to their cars or leave the area. No, from their stance to their numbers, this was about intimidation. Two snipers monitored the demonstrators from their armored vehicles, and other police began to close off side streets and other exits, to prevent anyone from coming in (or going out, for that matter). 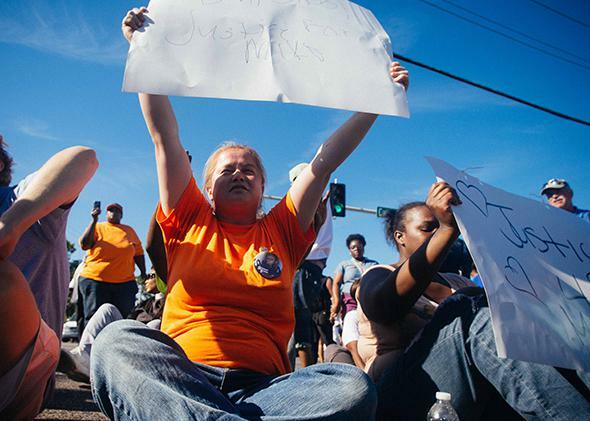 Protesters in Ferguson, Missouri, on Aug. 13, 2014. The crowd backed away from the police, but people were clearly agitated by the show of force. Still, there was no aggression. At this point, I drove 15 minutes down the road to another event, one organized by the demonstrators. The contrast was incredible. There, hundreds of people were gathered in a community party, oblivious to the crackdown three miles away. When I returned to the standoff, an hour after SWAT teams arrived, streets were completely blocked off, helicopters were circling, and officers were pouring tear gas onto West Florissant and the surrounding neighborhood, launching flash bangs, shooting rubber bullets, and using noise-based weapons to force people inside. Police say this was a necessary response—someone had thrown a Molotov cocktail, and there is a photo to confirm as much. But the full picture tells a different story. If elements of the crowd reacted with violence, it’s because police stoked it with repression. So far, police have killed an unarmed teenager, stonewalled anyone requesting information, and met peaceful demonstrations with draconian crackdowns. Indeed, at every stage, police have opted for repression rather than communication. Which is to say that, as much as some reports have focused on the Sunday night riot, the chaos in Ferguson has much more to do with a militarized, out-of-control police presence than it does with any of the demonstrators. Read the rest of Slate’s coverage of the protests in Ferguson, Missouri.